Hanoi Central Backpackers Hostel i Hanoi, Vietnam: Reservér nu! Central Backpackers Hostel created by an awesome local guy that brought you Central Backpackers Hostel chain in Vietnam, comes to Hanoi Central Backpackers Hostel on Thanh Ha st., with all of the same charm and deals to suit the needs of today’s travellers with no hidden costs. Also still cheap for those on a budget and as always we will cater the price to suit your needs. 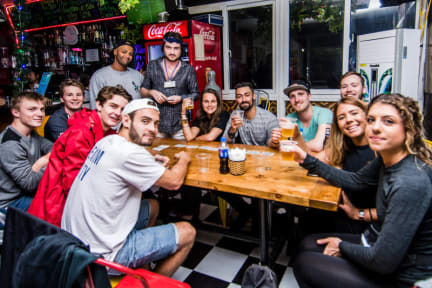 The amazing things about Central Backpackers Hostel - Old Quarter are first and foremost the nightly great big parties till 11:00pm, lively atmosphere, awesome people you meet, who will be sharing their travelling experiences from all around the world in the communal area over 1 or 10 beers at happy hour and more..! 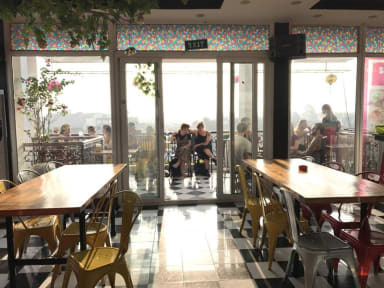 Secondly the brilliant and friendly staff that will go out of their way to ensure your experience is the very best you can have whilst in Hanoi. So the only thing you need to do is ask for whatever you need then we will help you to sort it out. Our travel desk team always be happy to help you out with planing or any tours booking and of course we do highly recommend our Halong Hideaway Tour, Sapa Trek Homestay, other daily tours and settle your onwards transport or get help with visas. Just step into our lobby or contact us in advance. You can also book all of our adventurous packages in advance. This was probably the best hostel I stayed in in Vietnam! The atmosphere was just amazing! The staff was super friendly and they were constantly trying to make my stay more pleasant. On day our A/C stopped working and we were immediately switched to another (better) room! Only good things to say about this place! The hostel also helped me book a trip to both Sapa and Halong Bay - very easy, affordable and fun! However if you seek a quite antisocial hostel this is not a place for you. I stayed at Central Backpackers hostel for 4 nights and it was great. They have a nice and filling breakfast to start your day off. In the evening there is a free pubcrawl and the skybar is great for hanging out/partying and meeting new people. Furthermore I booked at trip to Sapa through them and it was a great trip for a very fair price. I would definitely recommend you to stay here. Overall we found the location of the hostel great - but the street the hostel is located on is kinda creepy. The staff and personal was amazing and really sweet and the breakfast was great. Unfortunately the cleanliness of the restaurant/bar is awful - we so several cockroaches up there during our stay. The crowd at the hostel was very young and people were very unpolite (yelling and partying in the hallways at 11:30-12 p.m in the evening) so make sure that you want to party all the nights. Very shady area just around the hostel, but luckily close to city center. If you’re looking for a place to meet people and party all the time, this is the place for you. Too loud and hectic for me and my friends. The beds were very hard.